If you’ve ever spent one of those unforgettable evenings basking in the ambiance of Paris’ Champs Elysees, inhaling the flowered beauty of Copenhagen’s Tivoli Gardens, mingling with a fun-loving crowd in Barcelona’s mid city, or ambling along San Antonio’s River Walk, you’ve already experienced something of the feeling desired by the organizers of San Clemente’s forthcoming Art Walk. George Gooch and Dave Donaldson, community activists, are cooking up a caldron of art, culture, cuisine and atmosphere to create five “enchanted evenings” for our community this summer. Following the success of last year’s Art Walk, Gooch, a professional photographer and President of both the San Clemente Art Association and Garden Club, and Donaldson, owner of the Beachfire Restaurant, founder of the Downtown Restaurant Association and contributing member of the Downtown Business Association (DBA), are inspired to bring a European touch to our Southern California enclave. The 2004 version of the Art Walk is a summer series of Thursday evenings, from 6 to 9 pm, on May 27, June 24, July 29, August 26 and September 30, 2004. 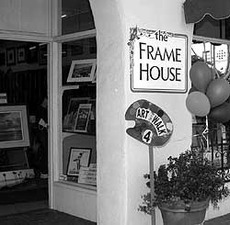 A time when members of the residential and business communities converge in a fashion only a town like effervescent San Clemente can host. Artists, both professional and amateur will be “judged in” by Gooch and Donaldson. Members of San Clemente’s Downtown Restaurant Association planning to participate include: the Vine, Gordon James, Café 207, Antoine’s, Carbonara’s, The Village, A Matter of Taste, The Library, El Ranchito, The Village Gourmet and the Beachfire Restaurant. 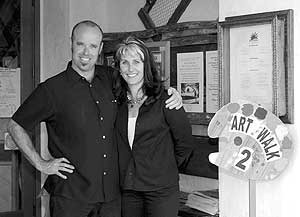 Owners and managers are enthusiastically supportive of the concept, promising especially delicious dinners and atmospheres contributing to the Art Walk theme. They will rotate over the six Thursdays, providing free wine for passerby and patron tasting. Gooch is taking care of the program and map; Donaldson is lining up the galleries, restaurants, and members of the DBA to participate. It will be an opportunity for many downtown businesses to keep their doors open during the Art Walk, for the purchases of paintings, gifts and other merchandise. Last year’s first ever Art Walk was modestly successful. Eleven art galleries participated and contributed funds, the Art Association and the DBA helped with expenses, and Gooch contributed some of his own money. “Now we have the talent and influence to obtain support collectively rather than singly. Some of the galleries don’t have a lot of money and just get by. We want to help them, too. We want to keep the art galleries we have,” said Donaldson. Other elements being added to the tasteful caldron may include, the organizers hope, a shuttle bus to enable the tour to extend to other locations such as Jason Kuncas’ JK Art and Design Gallery and the Art Supply Company. The participation of the Casa Romantica, which may become an anchor for this particular Art Walk, is also in the planning picture.